2) Remove temporary site toilet. I was out on site at 6.30 am and left at 7.00 pm. On Friday I had visited my local nursery. Robyn specialises in natives so I only bought plants for the border with Ian and some salt resistant sheoaks for the creek line. I went all out to have these survive -so osmocoate, plastic socks and mulching. The highest row is a local wattle which grows quickly, will provide some cover but will die in about 5 years. The lower row is a variety of bottle brush that will eventually reach 5 metres. Lower down on the slope I intend to plant a few deciduous trees to provide shade in summer and light in winter for the back door. This is to replace the 4 pine trees we have lost over the last couple of years. I also planted the sheoaks at the back border. I only had 4. I concentrated on plant site that had been set up from last year for some river gums. 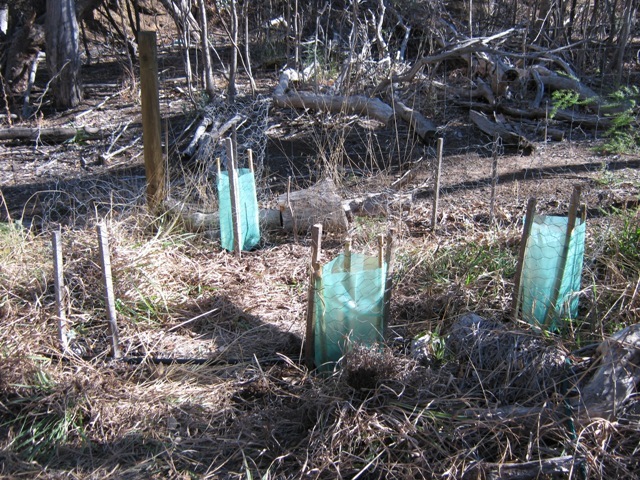 These had a protective cage, reticulated water and mulching. Last year Robyn gave me some free river gums. Of 20 planted only 3 survived - so time to try something else. I worked my way through 4 sites, digging back weeds, mixing in some Osmocoate, mulching and inserting a plastic sock inside the wire cage. 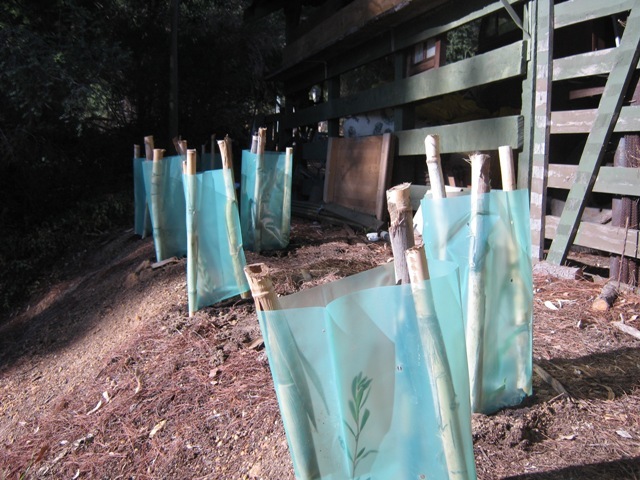 I even got to use some of my bamboo stakes that I recycled last week. All this took me about 3 hours and then I went on to working on the retaining ring for the Ecomax pump. I fired up my laser level and checked the fall of the block. From the garage floor to the edge of the creek there is a drop of about 400 mm. This means that at the Ecomax system, assuming an even gradient, it should be about 100 mm below the garage floor level. I tweaked up the level from last week then backfilled - I am trying to finalise the levels around the Ecomax system. 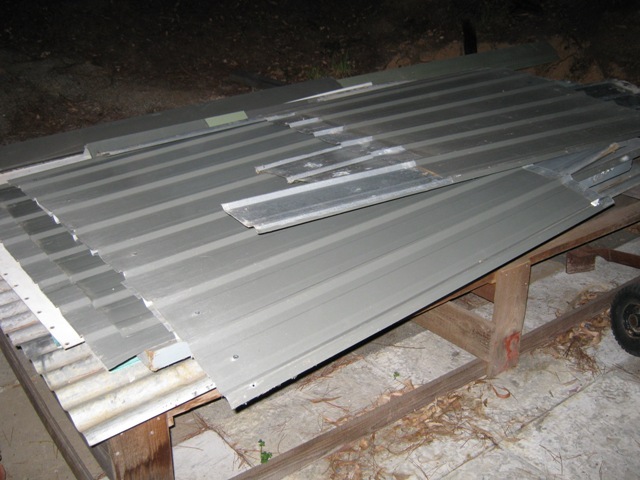 Eventually I will build a raised decking over the Ecomax. It will be used for the clothesline. I will build it in such a way that all the decking can be lifted off both tanks to allow full access for maintenance or plumbing. While I was at it - I boxed in the first 1.5 m of pipe running across to the trenches. This is so we can find it easily. 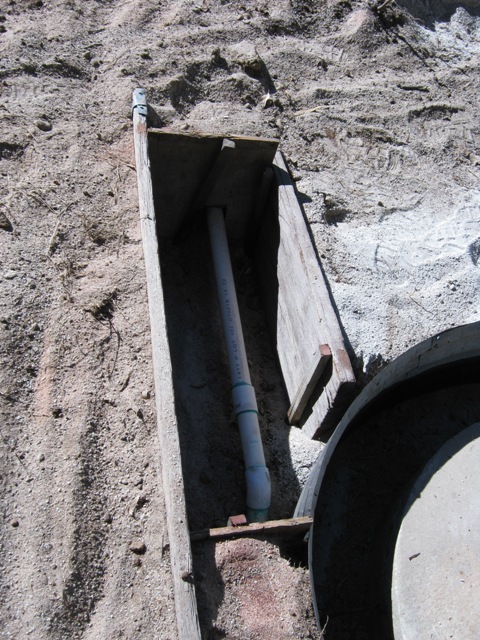 This pipe will need to be excavated and temporarily removed when we do all the work on removing the boral quarry dust. All this took another few hours and it was getting on to 3.30 before I started removing the temporary toilet. 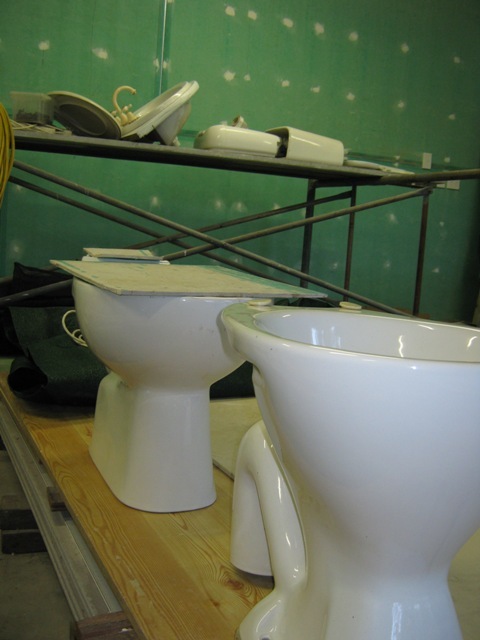 The first job was to remove all the fixtures and give them a clean - toilet and pedestal. 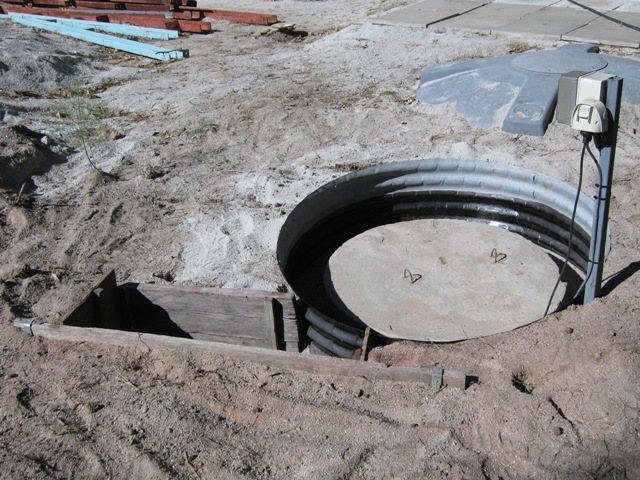 This included the extra P trap toilet that I had partly broken a year ago - its base was full of concrete. This time I managed to successfully use a diamond angle grinder to remove enough cement without causing further damage. Everything was dusty and covered in cobwebs so it all took a fair amount of cleaning. I then attacked the toilet with screwdriver and tek gun and had it reduced to a skeleton by the time night fell. I was pretty sad about taking it down so I am really hoping that I can set it up as a working unit on skids with a steel floor and sell it to someone who can use it. 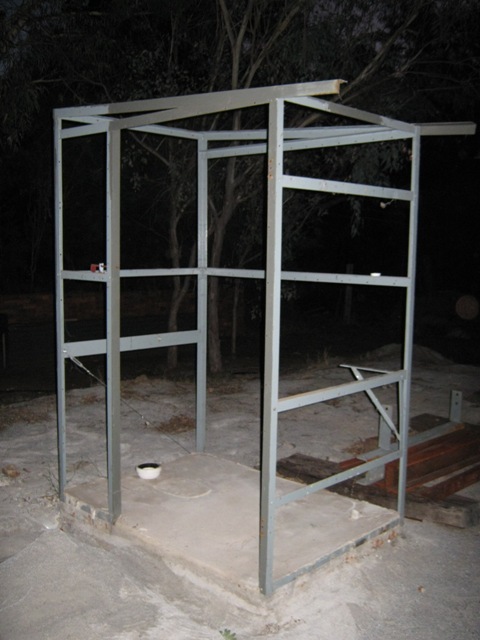 Next week I will need to attack the concrete base with a jack hammer so that I can release the framework.